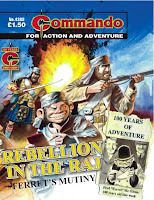 Here's the latest issues of Commando, on sale now in all good newsagents, which include a great new story drawn by Keith Page and two 'classic' tales from the archive, specially chosen to mark the title's 50th Anniversary. 'Red Runs the River' features art by Spanish artist Rafael Auraleón, who died in 1993. He first worked for the Spanish agency Selecciones Illustrada, drawing the comic strip 'Flash' for Space Ace and Lone Star. His work would later appear in Commando in 1961 and 1968, but he's perhaps best known for his work on US publisher's Warren's titles such as Vampirella and Eerie in the 1970s, where he was one of their most prolific artists. 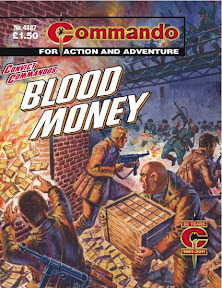 If there was one thing the Convict Commandos - Jelly Jakes, Smiler Dawson, Titch Mooney - liked, it was easy money. Unfortunately the money their leader Guy Tenby had them chasing wasn’t easy, it was very difficult indeed. For it was in Nazi-Occupied Norway... and the Nazis didn’t want them to get anywhere near it. He’s back - as you’ve never seen him before! Veteran war reporter Fred “Ferret” McGlone celebrates his landmark 100th birthday in style - and reminisces about his earliest days as a roving newshound on the shady, cobbled back streets of Victorian London. Get the inside scoop on this cracking story - a Commando exclusive, of course. It’s one you won’t want to miss! Many and fearsome are the perils that can beset a man on a swift-flowing river after dark. Japanese river patrols knew all these dangers, but armed to the teeth they feared none of them. 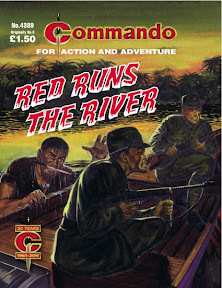 "The early batch of Commando stories contained a fair few jungle tales - complete with fanatical enemies," notes Editor Calum Laird in a special introduction for this latest 50th Anniversary reprint. "But this one isn’t quite like the others as the fanatic is on the British side. He’s a fighting mad Irishman determined to settle a score with the Japanese, and any Japanese will do. "The trouble is that his own side need to keep him out of the fighting as he’s too valuable to lose. "Eric Hebden weaves a classic Commando here, ably backed up by Auraleon and Ken Barr." "I’d love to tell you how I remembered this story’s memorable characters, well-thought-out, men-on-a-mission plot and action-packed finale from the day I first read it. 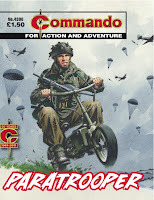 I’d love to… but, to be honest, the thing I remembered most vividly from reading “Paratrooper” in 1980 was the awesome sight of British soldiers whizzing around occupied France on cool little motorbikes," says Commando Deputy Editor Scott Montgomery. "As a child I recall wanting to have a go on one of those dinky Wellbikes. 30 years on, re-discovering this great tale has been a wonderful trip down memory lane (but sadly, not on a Wellbike). And, yes, I still want to have a go on one." 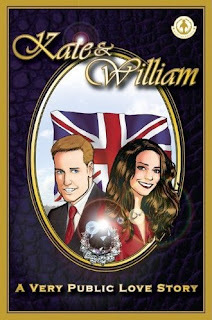 On the day of The Wedding it seems appropriate to review Markosia's Kate and William: A Very Public Love Story, their take on the story that will climax in Westminster Abbey round Noon today. Written by Bleeding Cool's Rich Johnston and illustrated by Mike Collins on the bride's side and Gary Erskine on the groom's side, the book version of the tale combines the two separate comics, Kate Middleton: A Very Private Princess and William Windsor: A Very Public Prince, into one double length flipbook. It is a safe bet that you already know the plotline so suffice to say that the book takes both its hero (beginning at the "back" of the book) and heroine (beginning at the "front") from their childhoods to their appearance on the steps of Westminster Abbey as a married couple, which is shown as a centrespread in the middle of the book. Writer Johnson tells the two separate stories as snippets from their lives with Kate's in a girl's diary format and William's as newspaper style headlines. As the story reaches St Andrew's and their lives intertwine, so the two stories show some of the same incidents from both sides including the now famous fashion event with Kate in the see-through dress. The Kate story works better, possibly because it is less familiar, but more likely because it seems to have fewer jumps in the narrative showing as it does Kate falling for William while in the William version they are apparently suddenly a couple. It is interesting to see how the two artists deal with the similar subject matter. Collins take on the Kate story makes the characters more elegant than Erskine's more accurate style on the William story, but they are well assigned to their stories as I can't imagine the book working at all if the two had have been swapped around. Indeed the one major event that they both cannot get away from is that dress and Erskine's take is typically accurate, based on the available photos and showing what the audience saw, while Collins take is rather more glamorous and possibly more in keeping with what William thought he saw. The book is good, not great, but good and an interesting addition to the biographical comics that are becoming more prevalent nowadays. Personally I think that my interest in it will increase in the years to come as a record of how the couple were perceived today, much in the same way that I find DC Thomson's Princess Margaret: Told In Pictures, that was issued in time for her wedding over half a century ago, fascinating as a period piece. In the end it doesn't really matter what any reviewer says about this book. If you are already sick of hearing about the wedding then you won't be touching it with a barge pole (but still no doubt making the most of your Friday holiday) while if you are sitting in front of your TV with your union flag ready to wave as the couple recreate the book's centrespread and step out onto the Abbey steps as man and wife, you probably already have it. 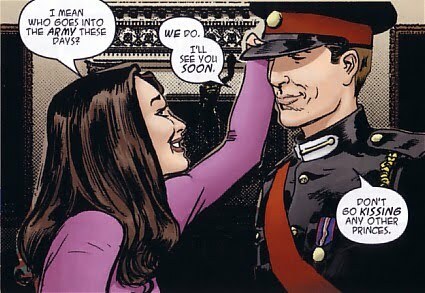 • There are more details of Kate & William: A Very Public Love Story, and the two separate comics it comes from, on the Markosia website. Titan Publishing has announced the launch of a brand new comics app, featuring Tank Girl and Lenore comics, available on iPhone and iPad for the first time ever. 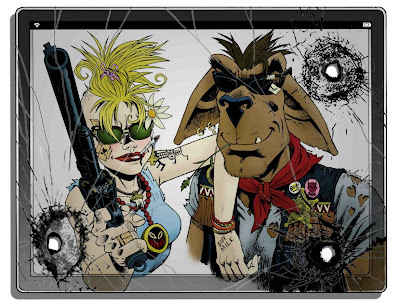 The new stand-alone app allows iPhone, iPod touch or iPad users to explore Titan’s digital comics portfolio, including – for the first time in digital format – Lenore volumes 1 & 2 by Roman Dirge, Tank Girl: Bad Wind Rising (Alan Martin & Rufus Dayglo) and Tank Girl: Skidmarks (Martin & Dayglo). The dark surreal world of Roman Dirge comes to life on the iPhone and iPad with the digital debut of his cult comic creation, Lenore. These gruesomely grisly tales see Lenore, the cute little dead girl, and her twisted menagerie of demented friends do battle with Nazi zombies, avoid the unrequited love of Mr. Gosh, and fend off the massed forces of Heck and an overeager, hungry earthworm. Bad Wind Rising is the brand new Tank Girl series by Alan Martin and Rufus Dayglo, which sees Tank Girl and her long-term partner Booga split up in dramatic and outrageous circumstances. Described by Ain’t It Cool News as ‘possibly this year’s coolest comic!’, the series is a must-read for all Tank Girl fans. 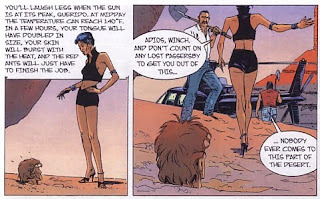 Martin and Dayglo’s previous series Skidmarks sees Tank Girl participating in an Outback ‘take-no-prisoners’ race in an attempt to win prize money for her friend Barney’s operation. The series is also available digitally for the first time in the new app. For the first time Titan’s wide-ranging portfolio is available in one app, featuring exclusive free content including WWE Heroes, Transformers (exclusive UK strips), Shaun the Sheep and Wallace & Gromit. Brand new comics are set to be released by Titan via the app throughout the year. • To explore Titan’s digital comics, simply go online to the iTunes app store and search 'Titan Comics' to download the app or follow this link direct. Comics @ Sci-Fi London takes place this weekend (30th April - 1st May) - a two day festival about the best of British Comics from the last 30 years in a lovely new space - The Blue Room - at BFI Southbank, London. Here's a full run-down of the weekend's events. This is not a ticketed event, however there will be a sign up sheet on the door on both days, if you would like to reserve a seat for individual panels. Doors open at 10am – Small press creators will be around to sell their work and meet visitors. 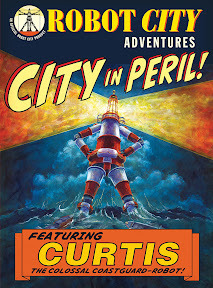 Creators in attendance include Paul Collicutt (Robot City Adventures), Phillipa Rice (My Cardboard Life), Alex Milway (The Mythical 9th Division), Eddie Robson (Doctor Who Adventures), V.V. Brown, David Allain, John Spelling (all City of Abacus), Lee O’Connor (Ctrl Alt Delete unmasks corruption), Zarina Liew, Yuri Kore, Clio Millett (Manga Jiman winners), Matt Jones (BERG design) and Matthew Sheret (Paper Science). Paul Collicutt (Robot City Adventures), Phillipa Rice (My Cardboard Life), Alex Milway (The Mythical 9th Division) and Eddie Robson (Doctor Who Adventures) discuss creating Science-Fiction and Fantasy comics for kids and having interested children in the format, how to keep their love of comics going. Followed by a children’s workshop run by Paul Collicutt. Three recent finalists – Zarina Liew (Runner-up 2009/2010), Yuri Kore (Winner 2009/2010), Clio Millett (Winner 2010/2011), Karen Rubins (Runner-up 2008, 2011) – of the Japanese Embassy’s ‘Manga Jiman’ (Pride in Manga) competition join one of the judges, to discuss the homegrown manga scene in the UK and the difference between Manga and Western style comics. Editor Matt Jones (principal, BERG design who commission Ellis’ new comic SVK) and writer Matthew Sheret (Solipsistic Pop), whose love of comics started with Warren’s work, discuss the work of comic book / multimedia writer Warren Ellis who has penned some of the most influencial SF comics of the last 20 years. Followed by 10 minute preview screening of new documentary, Warren Ellis: Captured Ghosts. Al Davison and Tony Lee (IDW Doctor Who comic), Tom Humberstone (Solipsistic Pop) and David Hine (Batman) talk about how working in small press comics has lead to work for mainstream publishers, but also provided a home to publish alternative titles throughout their careers so far. Followed by ‘Drop in and draw’ activities for first time artists wanting encouragement in creating comics, run by Tom Humberstone. Novelists China Miéville (three-time Arthur C. Clarke award winner for SF literature) and Denise Mina (The Field Of Blood) alongside artists Alice Duke (Self Made Hero) and Mark Stafford (Cherubs) discuss the influence of American writers Poe and Lovecraft on comic books and the difficulties posed by adapting their stories into strip format. Comics have been both the basis of and influenced the look of much TV and film over the past few years and so creators Martin Fisher (Battle Among the Stars), Huw J. Davies (Freeman, Garth), Edward Ross (Filmish, Parasites!) and Roger Mason (2000AD, The Mice) will be talking about how their interest in both fields has led to cross-pollination in their work and how they see this influencing both media as a whole. A panel looking at the crossover between two popular genres with guests Denise Mina, graphic novelist Hannah Berry who will be previewing her new book Adamtime and David Hine who has written horror themed comics throughout his career from Strange Embrace to Spawn. This week’s Panel Borders radio show and podcast concludes a month of shows about comic book anthologies and collectives. 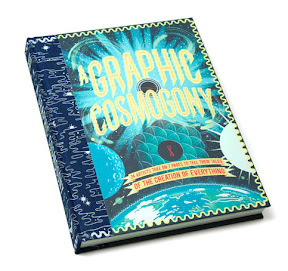 In today’s episode, Dickon Harris talks to Nick White and Alex Spiro from Nobrow Press in an interview recorded at the launch of their anthology A Graphic Cosmogony at the London Print Studio in November 2010, discussing the history of Nobrow and the unique graphic design sensibilities and use of colour by the publishing company. A reminder that the closing date for entries to the new Scottish Independent Comic Book Awards is Monday 2 May 2011. The awards, presented in association with the Charles Rennie Mackintosh Society, are due to be handed out at the Glasgow Comic Con's separate evening event on Saturday 18 June 2011. There are three different categories in the awards, Best Comic Book/Graphic Novel, Best Artist and Best Writer, with entries open to work either created in Scotland or by a resident of Scotland or with a Scottish theme that was published between January 2010 and March 2011. There are more details of the Scottish Independent Comic Book Awards, as well as submission details, at the Glasgow Comic Convention website. Here's the cover of STRIP MAGAZINE Issue Zero - which will be given away free to Bristol International Comic Expo visitors next month. The sampler is the first print promotion for the monthly STRIP Magazine from Print Media Productions, announced last year, which will launch later in 2011. The title is just part of Print Media Productions publishing plans which also include a number of graphic albums. The Iron Moon by Stephen Walsh and Keith Page has already been published and Mirabilis: Year of Wonders - Winter Book 1 by David Morris and Leo Hartas will be on sale at the Expo. Issue Zero features background on key strips in the new comic magazine such as Black Ops Extreme by John Freeman and PJ Holden, Warpaint by Phil Hester and John McCrea, Age of Heroes by James Hudnall and John Ridgway, Savant by Jim Alexander and Ferrer and Carlos Vila. The sampler comes wrapped in a cover by Smuzz, perhaps best known to comics fans for his work on 2000AD's 'ABC Warriors'. The image is taken from his new comic, 'Crucible', which will feature in STRIP Magazine. The Sampler also includes details of a special competition in the Sampler which will offer comic creators the chance to have their work in the title when it launches later in 2011. Print copies of Issue Zero will not be available until the Expo, with e-copies available shortly afterwards. A special PMP panel will take place on Sunday at the Expo. Who Remembers The Mighty Thor? (With thanks to various British comic fans): The launch of the new Thor movie today in the UK prompted memories form British comic fans of Marvel UK's short-lived Thor-inspired reprint, The Mighty Thor. Published in 1983 (Issue 1 cover dated 20th April), the title's launch followed the demise of a second Fantastic Four weekly. 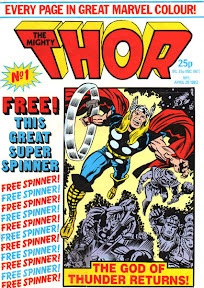 Thor had been a back up strip in many a UK Marvel title over the years - and, indeed, was one of the first Marvel superheroes to be published in Odhams Fantastic comic in 1967 - but had not had his own UK title. Proclaiming that "Every Page" was in "Great Marvel Colour! 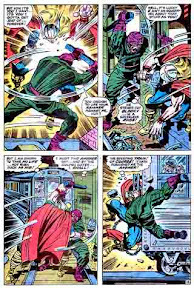 ", the reprint of Thor #171, drawn by Jack Kirby,was actually only published in full colour for part of the title - and the printing itself left a lot to be desired, with some printed issues suffering a lot of "off registration". Even those pages that did print well were different to the colour of the original Marvel US editon, as the sample below indicates. As with all UK comics, the first issue included a free gift - in this instance, a 'free spinner', a gun-shaped plastic item with an elastic band in it which 'fired' a cut out circle of blue plastic. 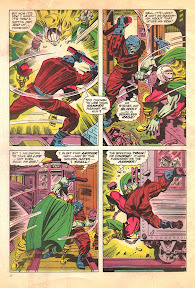 Although starting solely with Thor, it wasn't long before the 28-page comic included a back up strip - usually Captain America, although Tales of Asgard also featured. Tim Quinn and Dicky Howett also contributed a half page 'Fantastic 400' cartoon alongside the usual mix of centre page mini posters, competitions and other features such as 'Bullpen Bulletins' promoting MUK's comics range. The Mighty Thor itself proved short-lived, lasting just 19 issues before merging with the Original X-Men weekly to become Thor & X-Men. Marvel UK fans recall the problems with the printing lasted several weeks, which can't have helped sales, but perhaps this was a title that was always destined for merger, as part of a wider effort to boost the sales of titles. 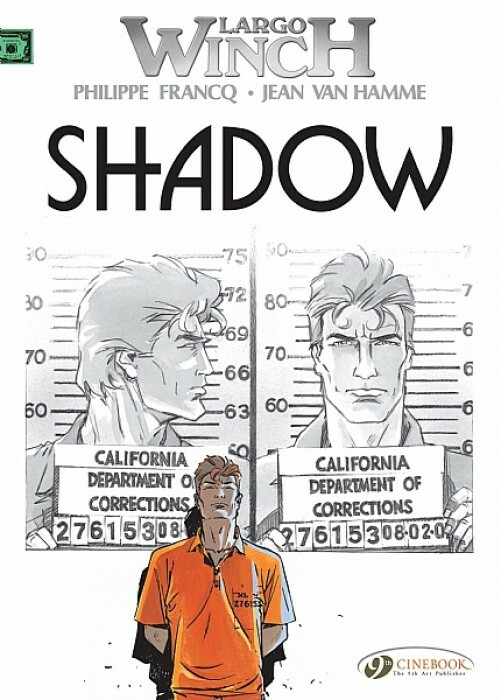 Largo Winch, writer Jean Van Hamme and artist Philippe Francq's James Bond-like billionaire returns in his latest two part adventure in Cinebook's Golden Gate and Shadow. 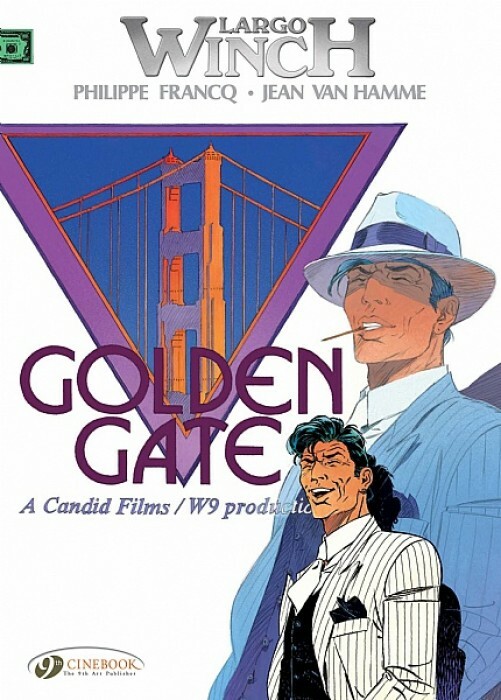 Winch's old friend Simon Ovronnaz has been hired to play Mike Shadow in a new TV series called Golden Gate, a series that is being made by one of the W Group's companies. However Ovronnaz isn't a great actor and the series is phenomenally expensive which leads the W Group to believe that it is a cover for money laundering and they send in a financial investigator, Sarah Washington, who quickly goes missing. With the series being bankrolled from the gambling den of Reno, Winch sets off meet his old friend, find the missing Sarah and get to the bottom of just what is going on. Jean Van Hamme is so good at writing modern thrillers that it is virtually a foregone conclusion that any Largo Winch story will be both intriguing and action-packed and, with the luxury of being spread over two books, the reader is given time to get to know the characters and situations a little better before the climax. Golden Gate and Shadow are no different and we are taken on a roller coaster ride of money laundering, kidnapping, prostitution, people smuggling and snuff movies all told at the sort of non-stop pace that we have become used to from Largo Winch books. Yet despite the frantic pace the story does takes long enough to play out to allow Winch to be arrested and imprisoned (as the cover of the second book reveals) as well as finding himself literally up to his neck in trouble in the Nevada desert. Philippe Francq's artwork rides the same roller coaster with 1930s style car chases (as part of the TV series), modern day motorbike chases, helicopter chases and even horseback riders chasing a train and he covers it all with his usual accuracy and eye for a pretty lady. Largo Winch books are always great entertainment and there is almost a danger when reviewing them of getting complacent - I expect them to be a great read and they always are but how can the next story top the last? 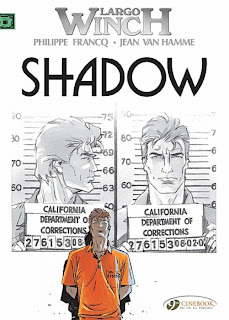 Yet, having said that, Golden Gate and Shadow continue the series trend of cracking Bond-like adventure and leave me hankering for the next pair to be published. There are more details of the English language Largo Winch books at the Cinebook website. There are more details about the Largo Winch series of books as well as the films at the official Largo Winch website (in English). 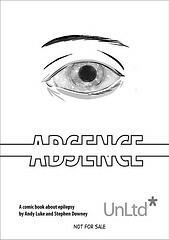 Writer Andy Luke and artist Stephen Downey have recently released Absence, a comic book based on Andy's experiences over 30 years adapting to a life with epilepsies: puberty, first jobs, college and “sorting it out”. Andy Luke is a Belfast resident, a writer who draws. He mostly self-publishes with works including Bob’s, TRS2, Gran, Optimus and Me and Don’t Get Lost, and sells his comics direct to the public at locations around the UK. Stephen Downey is a Belfast based comicbook artist and illustrator who has worked with Titan Publishing, AAM/Markosia, Atomic Diner, Heske Horror, Comic a Gael, Insomnia Publications and Beserker to bring his comics and artwork to the masses. He's the co-creator of Cancertown and the recently-released Slaughterman’s Creed, both with Cy Dethan. 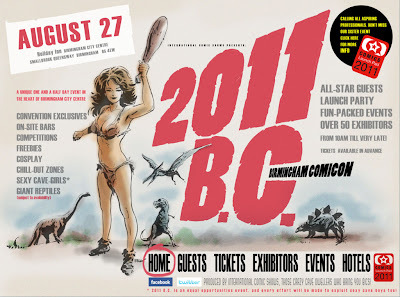 (via Paul Birch at Speech Balloons): Birmingham is to host 2011 B.C., an all-new comic convention on Saturday 27th August. Reporting for the Birmingham Mail's Speech Balloons coulmn, Paul Birch reports the new day and-a-half event of 2011 B.C. is being organised by International Comic Shows, the people behind British International Comics Show and the upcoming Comic Launchpad on Saturday 18th June. The new one day event springs from the lack of a two-day BICS this year - the result of work at Aston University which meant that event's established venue, the Thinktank in Millennium Point, was unavailable. After an unsuccessful search for a new venue with similar facilities, the ICS team decided on this 2011 BC event instead, whose line up already includes guests such as Eisner Award winner Chris Sprouse (Tom Strong, Batman) Watchmen co-creator Dave Gibbons and Peter Hogan (author of books on bands such Queen and R.E.M. and comics ranging from The Dreaming to Tom Strong). 2011 B.C. will take place at the Holiday Inn Birmingham, close to Nostalgia & Comics. Admission will be free to children under 12 accompanied by an adult. Literature's best known pirate returns in Neptune, the second book of the ongoing story of Long John Silver written by Xavier Dorison and illustrated by Mathieu Lauffray. In the first book Lady Vivian Hastings employed Silver and his men to work for her aboard her brother-in-law's ship which is taking them to South America and the lost treasure city of Guiana-Capac. While Silver beguiles the crew with his stories, Lady Vivian's maid is killed in what appears to have been an accident below decks. As the tension on the Neptune increases, young Jack O'Kief is blamed for the death and sentenced to the lash. Refusing to admit to something that he knows was not his fault, O'Keif passes out after 10 lashes and is taken below to recover before another 10 lashes the following day. That night as Neptune sails into an enormous storm and, threatened by Doctor Livesey that he will expose him, Silver makes his move to take control of the ship. The previous book had both time and geography to play with in the setting up of the story and the locales it took the reader through before boarding the ship. Writer Xavier Dorison used them well to set up both the story and its vast array of characters and their various motives. By contrast the events in Neptune take place in both the confines of the ship itself and in over little more than a 24 hour period, yet in no way does this detract from the story. Indeed if anything this adds to the powder keg atmosphere on board the ship as certain characters jockey for power and the body count rises. 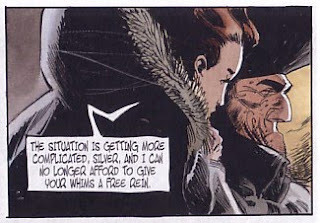 Dorison's script is well served by Mathieu Lauffray's moody artwork. From one night, through the next day and into the stormy night beyond within the confines of a sailing ship, Lauffray's work is never once repetitive and never less than exciting. As the wind rises the visual angles within his panels take on a life of their own as the ship sways to both the external and internal storms taking place. Long John Silver - Neptune continues to build to the foundations laid in the first book and raises this series from the great to the excellent. For readers who enjoyed The Chimpanzee Complex for its complex and mature scripting along with fine artwork in a limited run series, then Long John Silver really should be you next port of call. 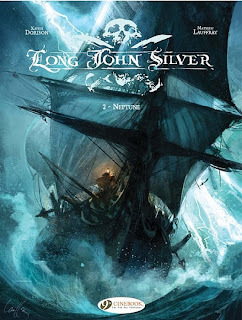 There are more details of the Long John Silver series on the Cinebook website. 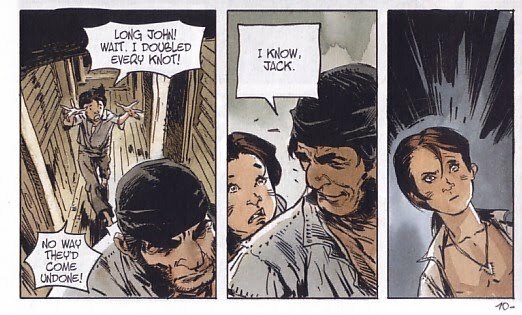 There are more details of the original French language versions of Long John Silver on the Dargaud website (in French). (with thanks to Joel Meadows): After a gap of two years, ace comic and media magazine Tripwire will be available to order from Diamond US in Previews. If you go to page 351 of Previews May 2011, you can order TRIPWIRE#55, item code MAY111336. For £6.95 UK/ $9.99 US, you can get 124 pages in full colour. 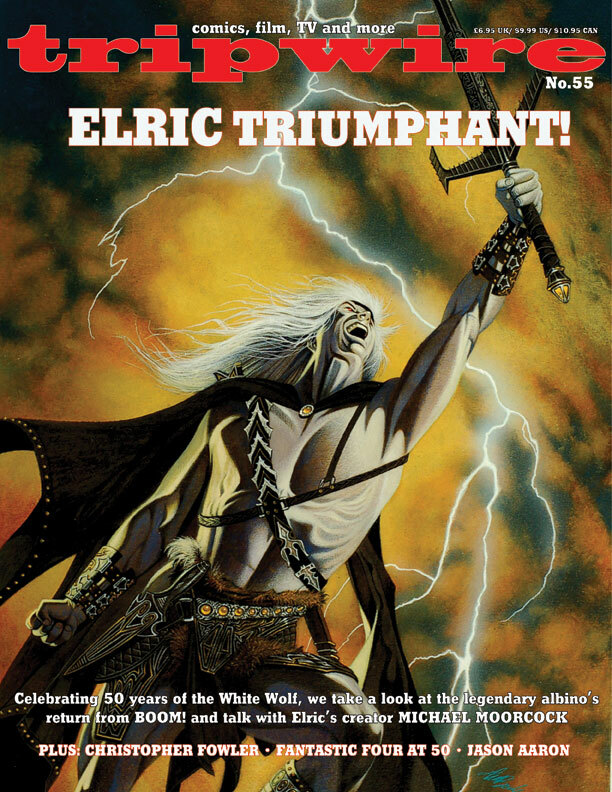 Featuring an exclusive painted cover by illustrator David Michael Beck, this issue celebrates Michael Moorcock's Elric anniversary by talking to Moorcock himself, looking back at the past of the character in comics and what Boom! has planned for it. The magazine also profiles movie location scouting company Sarah Eastel plus London fantasy author Christopher (Bryant & May) Fowler talks about his career. It's 50 years since Fantastic Four #1 so Tripwire is commemorating this with a look back at Marvel's first family with the help of some of the creators who've been part of FF history. Then there's STRIPWIRE, featuring 22 pages of comics from artists such as Roger Langridge and Kev Mullins, a profile of classic artist LB Cole, the return of old favourites like the Power List and the Graphic Novel roundup and a look at the success of Paizo's Pathfinder RPG.